This might be considered ironic. 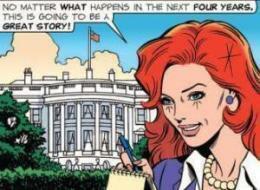 Brenda Starr has become an anachronis­m, much like the hard-hitti­ng reporter she played in her daily comic. It's sad to see yet another mainstay of newspapers to fold up their tent and head home, but it's clear that, at least for aspiring cartoonist­s, newspapers are no longer a viable medium.